My late father was a chief petty officer and a UDT frogman in WWII and I inherited my love of country and the U.S. Navy from him. I also inherited his love of military history, especially naval history. 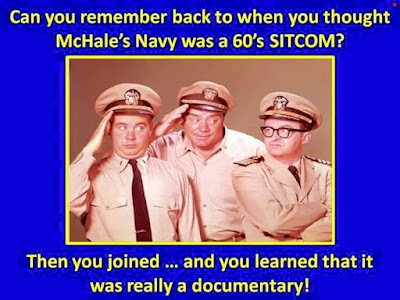 And I was also inspired by McHale's Navy and other TV programs, movies and novels about the Navy. As for McHale's Navy, I recall an episode where Captain Binghamton ("Old Leadbottom") was having lunch with an admiral and Binghamton told him that McHale and his crew were pirates. He had to watch them all the time. "You have to be ruthless with them, " Binghamton explained. The admiral responded that his style was less adversarial and his men loved him. "But that's me, admiral," Binghamton said. "Lovable and ruthless." 'Tis a good thing you weren't a big fan of "F-Troop"! When I joined the Navy in Jan. '66, I had very little notion of what was in store for me, but I knew that I preferred enlistment to the option: I had already received the Selective Service letter and a bus ticket for induction (probably Army or Marines). "Anchors aweigh" appealed to me more than "Incoming!" True, I'm not that big on horses. 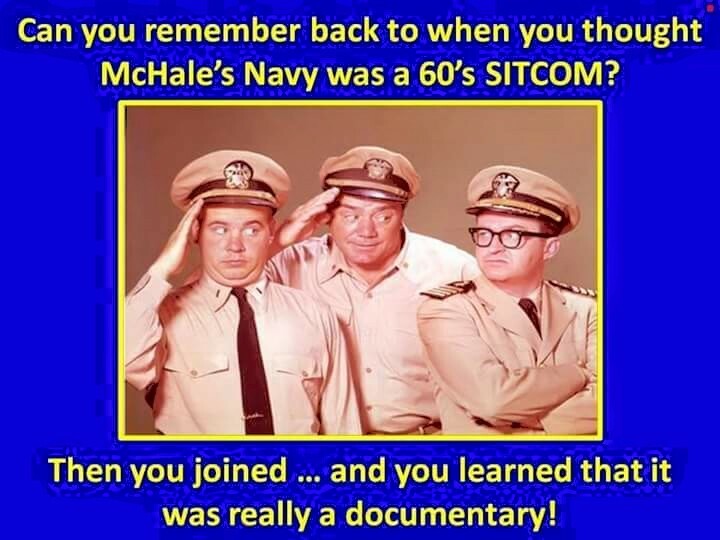 I wrote that my love McHale's Navy was one the reasons I joined the Navy. But the primary reason was my father. he was a chief UDT frogman in WWII. I grew up with an interest in Navy history, as well as novels and films about the Navy.